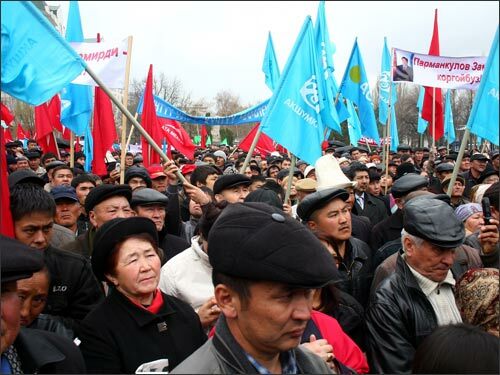 On March 27 the protest demonstrations, organized by united opposition movement, took place in the number of regions of Kyrgyzstan with the demand of early resignation of the President Kurmanbek Bakiev. The event has been arranged by United People’s Movement (UPM) that represents the alliance of all influential opposition structures under the mission of demanding the early resignation of Kurmanbek Bakiev. - to dismiss the heads of all security ministries and to appoint new people, approved by the united opposition. According to the head of UPM office, former Prosecutor-General of Kyrgyzstan, Azimbek Beknazarov, in case these requirements are not met, the opposition movement keeps the right to start termless demonstrations throughout the country. The number of meeting attendants in Bishkek and regions vary. According to the organization committee, the event attracted over 200 people in the regions and 5000 people in Bishkek. At the same time, the government announced the number of 3 opponents in the regions and 350 protesters in Bishkek. In the northern part of the country, Talas oblast, the opponents forced the deputies of one of the local councils to hold the urgent meeting. The protesters confirmed that they will not leave until they meet the Governor. There were no accidents in Bishkek venue. The police did not interfere. The road police surrounded the perimeter of the park, named after Gorky (where the meeting took place) and blocked the traffic. The local police forces with special equipment and dogs were located near the Sports Center, named after Kozhomkul, and Spartak stadium. 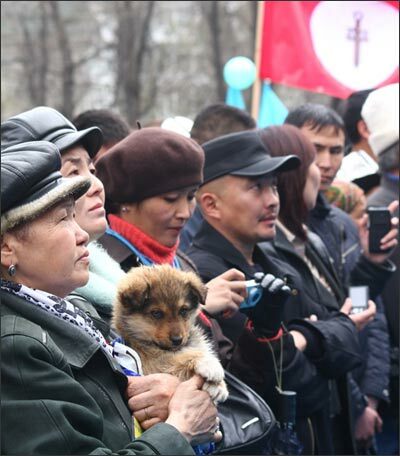 The demonstration in the southern capital, city of Osh, turned into press-conference of Anvar Artykov (see details at special photo-story of Ferghana.ru). The analysts predicted the intensification of political situation in Kyrgyzstan, facing the deep economic crisis. This situation was not improved even by the appointment of the date of presidential elections, as a matter of fact, one year earlier of expected term. Prior to the announcement of the certain date, the President Kurmanbek Bakiev announced his decision to run for the second presidential term in accordance with his constitutional right. Kurmanbek Bakiev came to power four years ago through the same type public disturbance. As a result of March 2005 events former leader Askar Akaev escaped to Russia, where he signed his resignation protocol. The majority of current opposition leaders, demanding new elections without current President, used to be the members of Bakiev team in 2005. Many of them took and left positions in the government, due to various reasons. Today’s meeting is not the first protest against Kurmanbek Bakiev. The biggest demonstrations took place in November 2006 and April 2007.